Blended winglets are wingtip devices that improve airplane performance by reducing drag. Boeing and Aviation Partners Boeing (APB) began making them available on the Boeing Business Jet (BBJ) and Next-Generation 737-800 in 2001. Flight test data demonstrate that blended winglets lower block fuel and carbon dioxide (CO2) emissions by up to 4 percent on the 737 and up to 5 percent on the 757 and 767. Blended winglets also improve takeoff performance on the 737, 757, and 767, allowing deeper takeoff thrust derates that result in lower emissions and lower community noise. Blended winglets are a proven way to reduce drag, save fuel, cut CO2 and NOx emissions, and reduce community noise. Boeing offers blended winglets as standard equipment on the BBJ and as optional equipment on the 737-700, -800, and -900 Extended Range (ER). Blended winglets also are available as a retrofit installation from Aviation Partners Boeing for the 737-300/-500/-700/-800/-900, 757-200/-300, and 767-300ER (both passenger and freighter variants) commercial airplanes. More than 2,850 Boeing airplanes have been equipped with blended winglets. The carbon-fiber composite winglets allow an airplane to save on fuel and thereby reduce emissions. The fuel burn improvement with blended winglets at the airplane's design range is 4 to 5 percent. For a 767 airplane, saving half a million U.S. gallons of jet fuel a year per airplane translates into an annual reduction of more than 4,790 tonnes of CO2 for each airplane. The addition of winglets can also be used to increase the payload/range capability of the airplane instead of reducing the fuel consumption. Airplanes with blended winglets also show a significant reduction in takeoff and landing drag. This article provides background about the development of blended winglets, describes the principle behind their operation, and outlines the types of performance improvements operators can expect from them. Blended winglets were initially investigated by Boeing in the mid-1980s and further developed in the early 1990s by Aviation Partners, Inc., a Seattle, Wash., corporation of aerospace professionals consisting primarily of aeronautical engineers and flight test department directors. The blended winglet provides a transition region between the outboard wing, which is typically designed for a plain tip, and the winglet. Without this transition region, the outer wing would require aerodynamic redesign to allow for the interference between the wing and winglet surfaces. The first blended winglets were installed on Gulfstream II airplanes. The resulting improvements in range and fuel efficiency interested Boeing, and in 1999, Boeing formed the joint venture company APB with Aviation Partners, Inc., to develop blended winglets for Boeing airplanes. Boeing adopted the blended winglet technology as standard equipment for the BBJ in 2000 and APB certified the winglets for the 737-700 and 737-800 airplanes in 2001. Since then, APB has certified blended winglets for retrofit installation on other Boeing airplane models (see fig. 1). 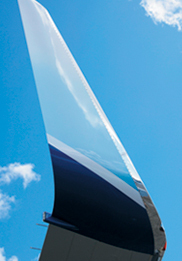 Blended winglets are also installed in production on Next-Generation 737-700/-800/-900ER models. Blended winglets are available for retrofit through APB on the 737, 757, and 767 models. The motivation behind all wingtip devices is to reduce induced drag. Induced drag is the part of the airplane drag due to global effects of generating lift. In general, wings will produce air motion, called circulation, as a result of generating lift. This motion is characterized by downward flow between the wingtips and upward flow outboard of the wingtips (see fig. 2). As a result, the wing flies in a downdraft of its own making. The lift vector is thereby tilted slightly backward (see fig. 3). It is this backward component of lift that is felt as induced drag. Blended winglets are upward-swept extensions to airplane wings. They feature a large radius and a smooth chord variation in the transition section. This feature sacrifices some of the potential induced drag reduction in return for less viscous drag and less need for tailoring the sections locally. Although winglets installed by retrofit can require significant changes to the wing structure, they are a viable solution when gate limitations make it impractical to add to wingspan with a device such as a raked wingtip. Lower operating costs by reducing block fuel burn by 4 to 5 percent on missions near the airplane's design range. Increase the payload/range capability of the airplane instead of reducing the fuel consumption. Improve takeoff performance and obstacle clearance, allowing airlines to derate engine thrust. Increase optimum cruise altitude capability. Estimate will vary depending on the mission parameters. Operators of blended winglets are able to gain the additional environmentally friendly benefit of reducing engine emissions and community noise. CO2 emissions are reduced in direct proportion to fuel burn, so a 5 percent reduction in fuel burn will result in a 5 percent reduction in CO2. Nitrogen oxide (NOx) emissions are reduced in percentages that are a function of the airplane, engine, and combustor configuration. At airports that charge landing fees based on an airplane's noise profile, blended winglets can save airlines money every time they land. The noise affected area on takeoff can be reduced by up to 6.5 percent. With requirements pending in many European airports for airplanes to meet Stage 4/Chapter 4 noise limits, the addition of blended winglets may result in lower landing fees if the winglet noise reduction drops the airplane into a lower-charging noise category. The noise reduction offered by blended winglets can also help prevent airport fines for violating monitored noise limits. One operator flying 737-700s had three years of data showing a fuel savings of 3 percent. Another operator flying 737s also reports that blended winglets are helping reduce fuel consumption by 3 percent, or about 100,000 U.S. gallons of fuel a year, per airplane. An operator with a fleet of 767-300ER airplanes estimates that installing blended winglets will save 300,000 U.S. gallons of fuel per airplane per year, reducing CO2 emissions by more than 3,000 tonnes annually. An airline that recently began flying 767-300ERs with blended winglets anticipates that each airplane equipped with the winglets will save up to 500,000 U.S. gallons of fuel annually, depending on miles flown. The airline plans to install winglets on its entire 58-airplane fleet of 767-300ERs, which could result in a total savings of up to 29 million U.S. gallons of fuel per year and a reduction of up to 277,000 tonnes of CO2 emissions annually. Blended winglets are a proven way to reduce drag, save fuel, cut CO2 and NOx emissions, and reduce community noise. They can also extend an airplane's range and enable additional payload capability depending on the operator's needs. Depending on the airplane model, blended winglets are available either as standard or optional equipment through Boeing or for retrofit through Aviation Partners Boeing. For more information on blended winglets and Stage 4/Chapter 4 noise certification, please contact Bill Freitag or Terry Schulze. Boeing Home | Commercial Airplanes | Contact AERO | AERO Copyright © 2009 The Boeing Company. All rights reserved.